Formal wear (Canada, US) and formal dress wear (UK) are general terms for clothing suitable for formal social events, such as a wedding, formal garden party or dinner, débutante cotillion, dance, or race. The Western style of formal evening dress, characterized by black and white garments, has spread through many countries; it is almost always the standard formal social dress in countries without a formal national costume. A dress code is a set of rules governing a certain combination of clothing; some examples are black tie and morning dress. Formal dress is the grouping of all the dress codes which govern clothes worn to formal events. The traditional rules that govern men's formal dress are strictly observed; from these derive the evening dress variants worn on many occasions, such as high school prom dances, formal dances, and entertainment industry award programs. The dress code considered formal in the evening is white tie. In the UK, morning dress is standard formal day time clothing (a lounge suit being still considered informal dress), but in the US/Canada morning dress is rare, having been replaced with the stroller and then the lounge, or business suit. Morning dress, however, does remain in certain settings in Europe, Australia, and Japan. 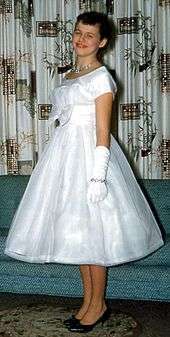 Girl in formal dress, USA, 1950s. The continual relaxation of formal dress standards since the end of the Second World War is redefining what clothes constitute formal and semi-formal dress. The original term full dress was used in the 19th century and the early 20th century to mean the most formal option available, while half dress and undress ranked beneath it. They indicated different clothes, but correspond somewhat to the 21st-century structure of formal, semi-formal, and informal. These are the terms used by traditional etiquette and dress consultants (especially for weddings), while contemporary consultants use looser, modern definitions, in which white tie is styled as most formal, very formal or ultra formal; black tie as formal; and the traditionally informal lounge suit as pseudo-formal. Moreover, modern advisers recommend black tie for events traditionally considered to require formal dress (white tie), and alternatives for what would have been semi-formal events. However, formal and semi-formal are unambiguous when it is known they are being used in a traditional setting, even though changing fashions can make these terms ambiguous; white tie and black tie on the other hand refer solely to the combination of relevant clothes themselves, regardless of their setting, and so are much less susceptible to misinterpretation. 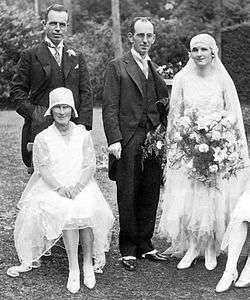 Particularly in America, but also around the Western world, there has also been a relaxation regarding the dress codes themselves, with full formal dress (white tie or morning dress) almost unheard of in many places. The dress codes counted as formal wear are the formal dress codes of white tie for evenings and morning dress for daytime. Although some consider black tie for the evening and strollers for daytime, as formal, they are semi-formal attires, sartorially speaking. The clothes dictated by these dress codes for women are ball gowns. For many uniforms, the official clothing is unisex. Examples of this are law court dress, academic and graduate dress, formal military uniforms and formal military evening dress. The required clothing for men, in the evening, is roughly the following: a (dress) tailcoat; formal trousers, uncuffed, with stripes on leg seams; white piqué bow tie; white piqué vest (waistcoat); white piqué front or plain stiff-fronted shirt with a detachable wing collar; cuff links and shirt studs; black patent leather court shoe; accessories. Women wear a variety of dresses. See ball gowns, evening gowns, and wedding dresses. Business attire for women has a developmental history of its own and generally looks different from formal dress for social occasions. Morning dress is the daytime formal dress code, consisting chiefly for men of a morning coat, waistcoat, and striped trousers, and an appropriate dress for women. 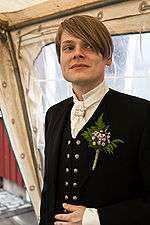 An Icelandic man wears the hátíðarbúningur formal dress on his wedding day along with a boutonnière. In Western formal state ceremonies and social functions, diplomats, foreign dignitaries, and guests of honour wear Western formal dress if not wearing their own national dress. Daura-Suruwal — worn as formal dress by men in Nepal. Bunad — worn as formal dress by women and men in Norway. Folkdräkt — worn as formal dress by women and men in Sweden. Hátíðarbúningur — worn by men in Iceland to formal events such as state dinners and weddings. Dhoti — worn by men in Pakistan, India, Bangladesh, the Maldives, and Sri Lanka. Sari — worn by women in India, Nepal, Bangladesh, Pakistan and Sri Lanka. Shalwar kameez — worn by both men and women in Pakistan, India and Bangladesh. Dashiki — worn by men in West African countries. Barong Tagalog — worn by men in the Philippines. Batik shirt — worn by men and women in Indonesia. Kebaya — worn by women in Malaysia and Indonesia. Cheongsam — a modern female variation of the Qing Dynasty silk dress, characterized by a high mandarin collar, and side open slits of varying lengths. It can be sleeveless, short, elbow or long sleeve, and has been adopted by most Chinese women as a Chinese wear, depending on materials and occasions. Changshan — a long male version of the qipao, which originated during the Qing Dynasty. It can be of cotton for ordinary wear, or of silk for those within aristocratic families. Beneath the changshan, the male generally wears white mandarin-collar long-sleeve shirt and a pair of dark colored long pants. Like the qipao, this changshan male gown has slits on both sides (at least knee level) as well. Worn nowadays either by Chinese men in the martial arts world, or as attire for weddings to match the qipao the bride wears. The qipao and changshan originated as Manchu dresses which government officials, but not ordinary civilians, were required to wear under the Qing Dynasty's laws. Gradually, the general non-official Han Chinese civilian population voluntarily shifted from wearing traditional Chinese hanfu clothing to the qipao and changshan. Bisht — worn by men with thawb and shmagh or ghutrah and agal in formal and religious occasions, e.g. Eid, in some Eastern Arab countries like (Saudi Arabia, Iraq, Kuwait, UAE, Qatar, Bahrain and others). Av Pak — both traditional and modern embroidered blouse worn by women in Cambodia at Special occasion, traditional festival and Formal show. Men's formal evening wear, or white tie, in 1912. 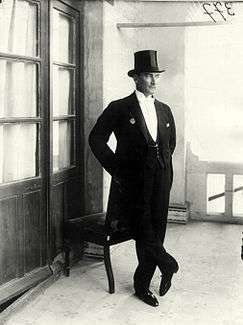 Mustafa Kemal Atatürk in evening formal wear, in 1923. Wikimedia Commons has media related to Formal clothing.